Matteo's Landscaping Company, Inc. provides complete tree trimming and removal services that ensure hazard reduction and making your trees healthier and more aesthetically pleasing. The life of your trees are also extended and they grow the way you want them to. If the trees on your property are not properly maintained you run the risk of property damage or personal injury caused by root growth, breaking/falling branches, etc. It should also be noted that tree removal could be a hazardous if not performed by an experienced and qualified person. Since Matteo's Landscaping is licensed and insured and have the necessary ISA tree trimming and arborist certifications, you can trust us for all of your tree removal and trimming needs! Whether you are a property developer, owner or manager, Matteo's Landscaping will take care of your tree trimming and removal needs in Weston, Pembroke Pines, Coral Springs, Fort Lauderdale, Plantation, Sunrise, Boca Raton, Delray Beach, Boynton Beach, Sunny Isles, Miami and throughout Broward, West Palm Beach and Miami-Dade counties. Tree and Palm trimming and pruning: By removing dead branches and pruning your trees on a regular basis you keep them strong, healthy and beautiful; and you also extend the life of your trees. We use many different tree trimming methods depending on the species of trees and how you want your trees to grow. We also prune out hazardous, dead and crossing trees. We provide crown thinning, crown cleaning and shaping services on all varieties of palms and trees. Tree and Palm removal: Our tree removal crews will remove your unwanted trees safely according to ANSI specifications. We are experienced and know how to bring down a tree without causing damage to your buildings, and landscape. Tree and Palm stump grinding and removal: Stumps can be an unsightly blemish on an otherwise stunning landscape. Matteo's Landscaping helps you to restore your property by safely removing and disposing of the stump, and leaving the area healthy and ready for healthy replacement growth. We own the necessary stump grinding machines and equipment that allows us to remove any size tree or palm stump anywhere on your property. Emergency tree removal service: We are available 24/7 to provide emergency tree service. Tree Disease Insect and Mite Treatment - Many trees are susceptible to a variety of diseases insect and mites. Diseases, insects and mites can infest your trees, weakening them and compromising their integrity with an increasing the chance of an accidental fall. Matteo's Landscaping can treat or take some preventative measures to help protect your trees from disease, insects and mites for years to come. Cabling and bracing may help support a tree, and can help you avoid having to remove the tree outright. The best plant health care program is implemented from the beginning by considering soil conditions, drainage, slope, erosion, climate, and other factors that can hamper or inhibit trees from healthy growing. Matteo's Landscaping can help you with tree selection and planting. 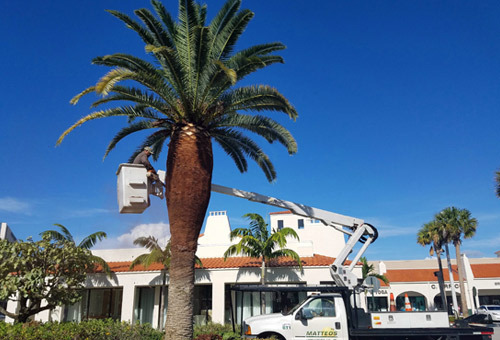 The Tree and Palm Trimming Division of Matteo's Landscaping is well trained in tree trimming and pruning techniques and standards for all types of trees. Our clean-up crews ensure that your property remains neat and uncluttered throughout and upon completion of the job. We also offer customized tree maintenance programs geared to your specific tree trimming needs and within your budget. To ensure the your business is running smoothly and we do not interfere with traffic flow and customers, we also provide weekend schedules if needed. Contact us today for more information on our tree trimming and removal services at (954) 444-1008 or complete the Contact Us form - click here.